How a pelican is equipped for specialized fishing? 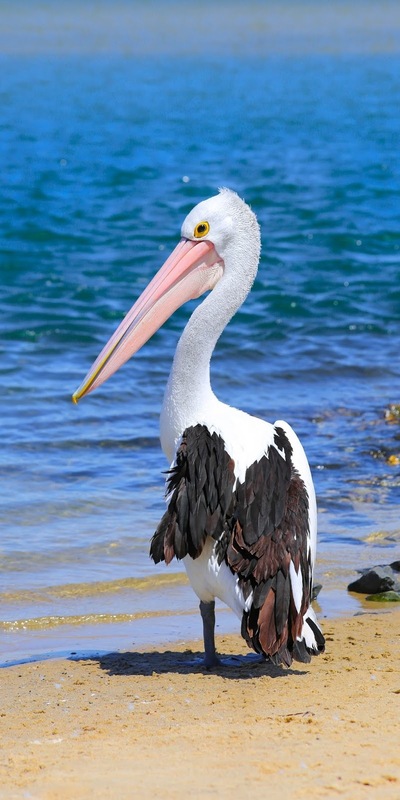 The pelican is found on lakes and rivers and along coasts in many parts of the world. Its long beak and huge pouch are perfectly equipped for its specialized form of fishing. When it feeds, it can scoop up over three gallons [10 L] of water along with the fish! It plunges into the water, filling its pouch with water and fish. Then it quickly drains out the water and, gulp, down goes the latest snack. It may weigh up to 30 pounds [14 kg], be over five feet [1.5 m] long, and have a wingspan of ten feet [3 m]. It is one of the largest birds. On land it is ungainly and comical; in flight it is a delight to see, flying with apparently minimal effort. A pelican’s takeoff is surprisingly efficient, even if a little cumbersome in appearance. This heavy bird rises from the water flapping its large wings, with webbed feet still splashing the surface water three, four, five or six times before it becomes truly airborne. Its appearance in flight, with head held well back, is the epitome of grace and grandeur. When they were landing, these birds reminded us of the flying boats of years gone by.